Just by meeting the national standards for PM2.5 levels we can avoid premature deaths up to 45% and by meeting WHO standards we could cut it down by 85% as stated by the latest research. 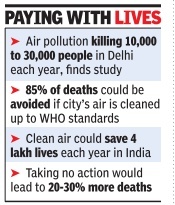 PM2.5 is the major air pollutant resulting in annual deaths of 3.2 million, immediate action plan must be made to bring down the levels as the percentage is likely to rise in the future. Previous Previous post: Is Delhi an undesirable city for expatriates ? Next Next post: Rain rain please stay in Delhi, go away some other day! !